1. Place the flour in a large bowl, make a well in the centre then crack in the egg and add half of the milk. Beat together, gradually adding the rest of the milk to make a smooth batter. 2. Heat a splash of the oil in a non-stick medium-sized frying pan. Add a ladleful of batter and swirl to coat the base of the pan thinly. Cook for 30 seconds or so until golden then turn and cook the second side. Repeat to make 8 pancakes. 3. Mash together the bananas and icing sugar then roughly stir into the mascarpone along with one of the Lyle’s syrups (golden, chocolate or strawberry). Divide the mixture between the pancakes, tuck in the edges then roll up neatly. Place two pancakes on each serving plate, dust lightly with icing sugar and drizzle with more syrup before serving. 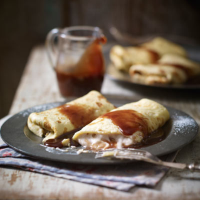 For a super-speedy result, use a ready-made pack of 8 Waitrose Pancakes. This recipe was first published in Wed Feb 01 14:47:32 GMT 2012.